Hertfordshire Puddingstone is a conglomerate of very well rounded flint pebbles, embedded in a matrix of fine pale coloured sand, all bound together by hard natural silica cement. 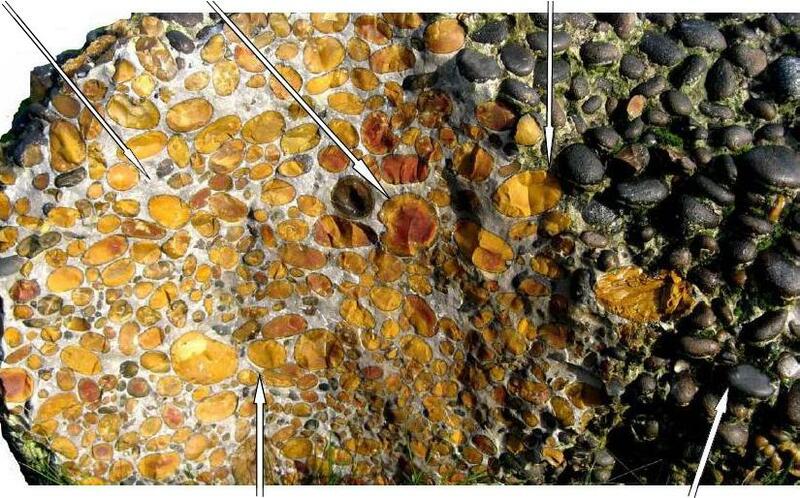 Most of the pebbles are coloured ochre or red, or a mixture, and have black rims. We are sure the colours are limonite and haematite, with the black rims possibly being goethite but exactly how the iron staining occurred is not known at present. A group of East Herts Geology Club members is actively researching local Hertfordshire puddingstone in our area to try to answer this, and other questions. The matrix is fine pale sand Most pebbles have black rims and are coloured ochre and/or red Pebbles are very well rounded.